Have you ever done an escape room? Even just the little escape room game? If so, you know that you have to use your critical thinking skills as well as your skills of observation if you want to make it out. Are these skills your kids need practice with? I know mine do. Despite using a critical thinking curriculum every year since they were in kindergarten, they still need practice. More real life practice rather than which doesn't belong and fill in the analogy. Those are all well and good, but not real applicable to life. Escape rooms, while they are still not super lifelike, I mean how often do you get locked in a room with a bunch of people because of some disaster, are still great for building critical thinking skills. Another benefit of escape groups is that they are a group activity. I don't know that there would be many you could complete on your own. And what a critical skill working in a group is. It is one thing that I think a lot of homeschool kids may not be exposed to. From my own personal experience public school kids lack it too, but maybe that has changed. So to improve both critical thinking skills and group cooperation in my own kids as well as the others in our co-op, I have been putting together escape rooms as one of our classes. 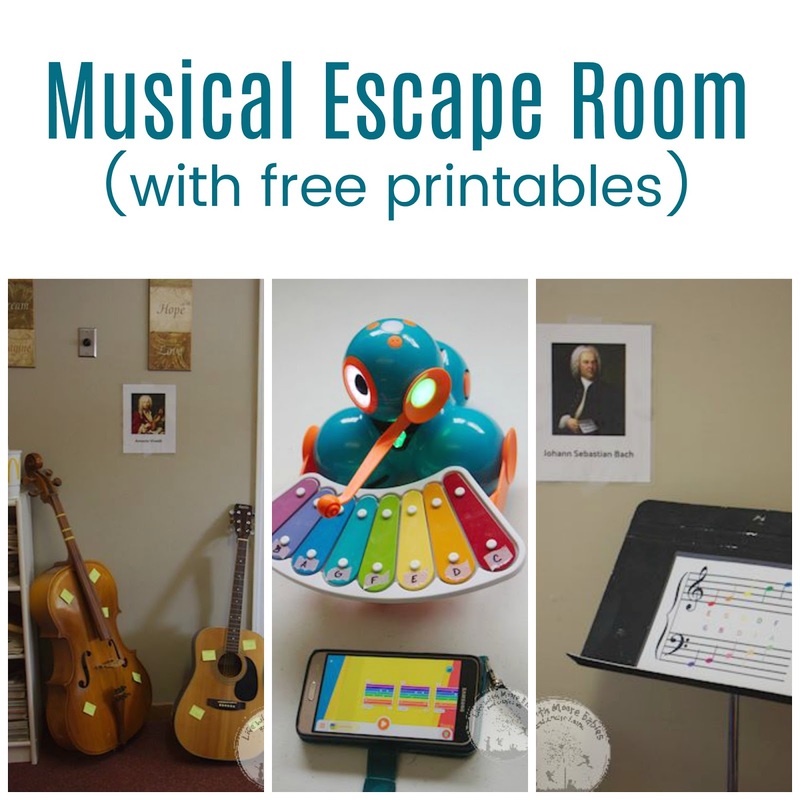 This music themed escape room is one of my first! The kids' goal for this escape room is to escape a troll by lulling him to sleep with his favorite piece of classical music. 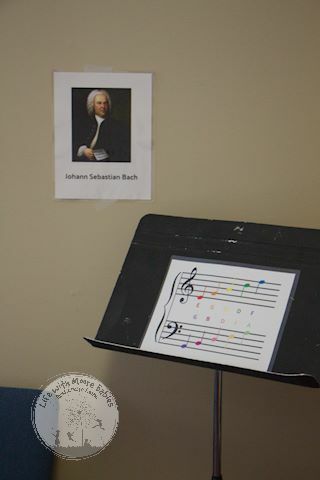 In order to do this, the kids need to find the song title, composer, and key of the piece in question. They did not need any musical knowledge to get out either. Everything they would need was provided in the clues given! To start with, I printed and laminated everything I didn't want the kids to write on. It has been a rule for the class that they can write on any paper that is not laminated. And yes, I had them trying to color on laminated paper, so unfortunately the rule was needed. 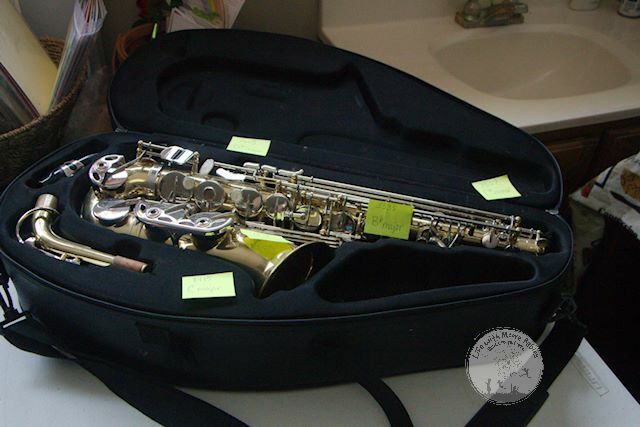 You will also need to prepare the envelope for your instrument sort. Place the label on a large envelope, and place all the instruments, the instrument family labels, and the clue about following music inside. 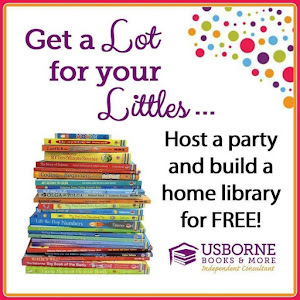 Place this in your room somewhere the kids can find it. 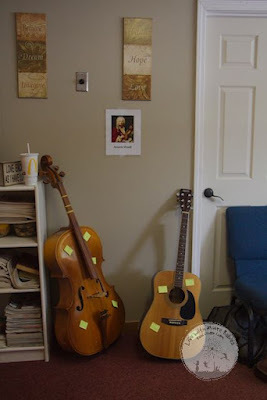 Next, I hung up my composer portraits on the wall around the room. I had to make a rule with my kids that they could not grab things off the wall otherwise they just ran around grabbing everything which gave them way too much input at once. 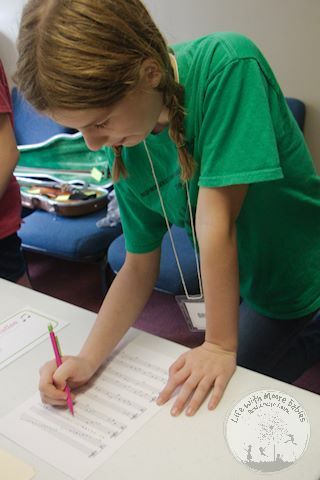 I placed my Clef Code on a music stand, so they could pick it up and use it with the puzzle given in their folder. I positioned my instruments around the room as well. I grouped them somewhat by family but not entirely. You can use any instruments you want as long as one is a cello since that is needed to solve the puzzles. 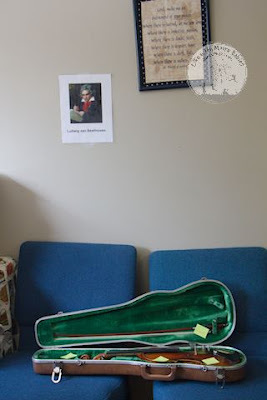 If you don't have actual instruments, you could also use posters of instruments. 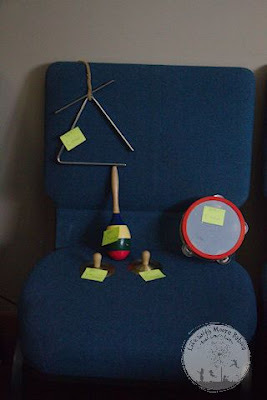 Now that you have your instruments set up, you will need some small post-it notes. On these you will write a four digit number as well as a musical key. I repeated numbers with different keys to act as decoys. I did make sure there was only 1 correct post-it, and it goes on the cello. Distribute the post-its between instruments. Make sure the correct one is on the cello (see printable for more information). Also be sure there are no duplicate numbers on the cello or the kids will be super confused when they get that far (I'm not speaking from experience or anything). The other clue you need is Dash. You can completely leave this out if you want by just having a cello as a representative of the string family. 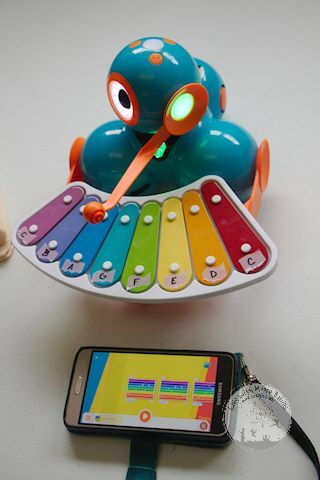 Or you can use a computer program or you can sit and play them a song on an instrument as long as they can see the final note which needs to be A. I labeled my Dash with washi tape knowing most of them had had little to no musical instruction (the blue note on the xylophone is A). Now you just need to make sure you have folder prepared to hand to the kids. I included the instruction sheet, hint needed cards, note math, clef puzzle, and alphabet decoder. Alternately you could hide these things in the room. The hint cards can be used as hints or can be hidden in the room as well. Now you're ready to play! 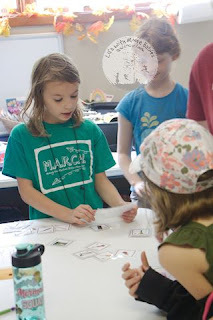 For our co-op class, I had a group of around 10 kids ages 8-13. I gave them 45 minutes to solve this, and they did it! I read them the challenge and handed them a folder that included the above listed items. Handing them the puzzles always makes it easier, so if you need it to be harder, hide them in the room. They need to solve the Clef Clue which will read "A FACE EG" which should direct them to the faces on the wall. The only EG will be Edvard Grieg. The need to solve the note math to obtain the code 7403; this code will need to be on a post-it with the key B minor stuck to the cello. The should sort the instruments into families finding the string family to be the least represented as suggested on the envelope label. If they follow instructions in the envelope to Dash, they can find the last note he plays is A which matches to the cello card in the instrument sort. If they have done all of this they should have the key as well as the composer, so all they have left is the music decoder for the name of the piece. Of course it is "In the Hall of the Mountain King," what else would put a troll to sleep. 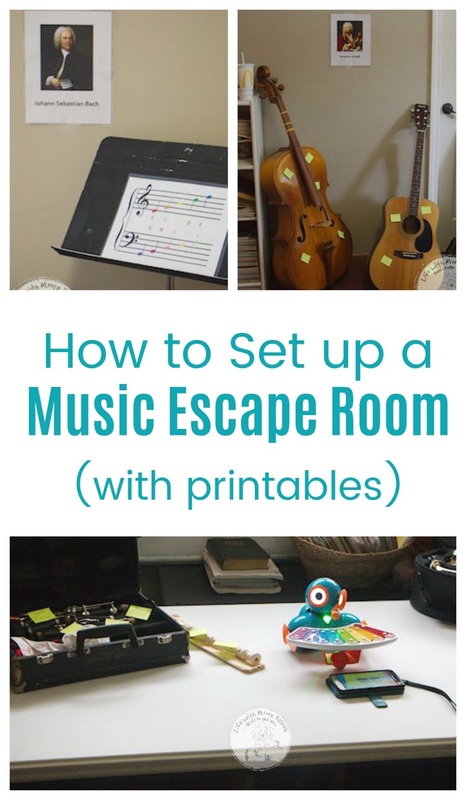 One tip to help your kids make it through the escape room; if they are not used to solving puzzles or working as a group you may have to give them extra hints. Like reminding them to think about why things are in the room especially things not normally there and to pose questions to the group because other people think of things differently and therefore may know the solution. I know it took my homeschool co-op classes a few weeks to get the hang of it, and still they need reminders. But if you help them through without giving them answers escape rooms can be a rewarding experience. If you would like to set up a Music Themed Escape Room for your homeschool co-op or group or even just your kids, you can download the printables from my subscriber resource library. 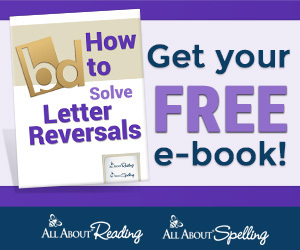 You will need to be an email subscriber to get the password; you can join our weekly newsletter here.